ARIEL QUARTET 2018-2019 Season Highlights | Kirshbaum Associates Inc. The rare talents of the Ariel Quartet, praised for their sonic unity, striking musical idioms, and “gift for filling the pristine structures of Classicism with fire,” (The New York Times) have become one of the most distinctive voices in the golden age of young string quartets. 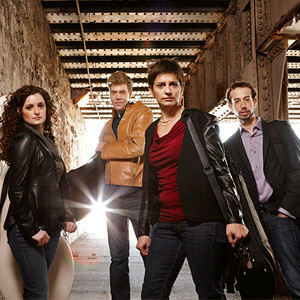 Formed while its members were still middle school students nearly twenty years ago, the Ariel Quartet has perpetuated a glowing international reputation, especially following the release of their debut recording in March 2017 on Avie Records. The recording, featuring and inspired Brahms and Bartók pairing, is a reflection of the deepening characteristic vitality the Ariel Quartet has developed in its years of simultaneous artistic growth. They state: “The two composers communicate in a distinctly personal style and language, yet in many ways they are kindred spirits. Having approached the string quartet formation with profound admiration and knowledge of its German roots - Beethoven's quartet oeuvre in particular - both composers also found enormous inspiration in the folk music of Hungary and its surroundings. What was native heritage for Bartók was also seen in Brahms' deep affection for Hungary, which found inspiration during his late teen years, and both works on this CD are infused with these indigenous flavors.” Further recording projects of similar conceptual patterns are planned for future release. The Quartet’s touring schedule in the 2018-19 season spans major cities and smaller communities across and between the East and West Coasts, and throughout Canada. They continue to perform Brahms and Bartók, as well as an impressive assortment of new and classical repertoire by Mozart, Mendelssohn, John Harbison, Webern, Beethoven, Schumann and others, and they collaborate with acclaimed pianists Daniil Trifonov and Orion Weiss.